If you’re still yearning to be fishing even during this winter’s cold weather and snow, you might want to give ice fishing a try. With the right clothes and gear, you might even like it better than fishing on a hot summer day. 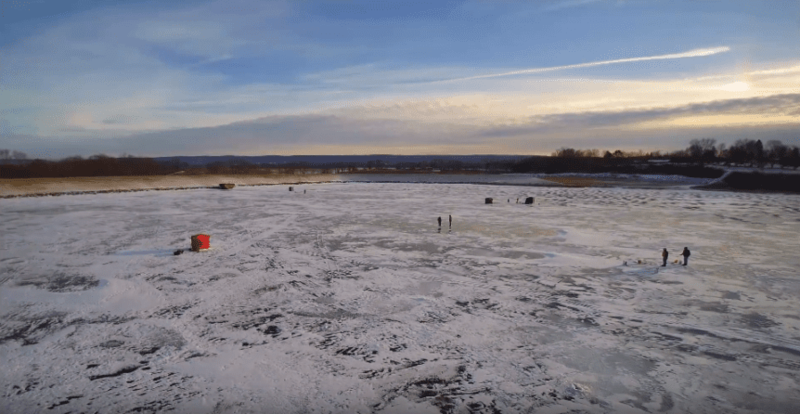 Columbia and Montour counties offer a number of great ice-fishing locations, according to one of the area’s fishing experts, John “Toast” Oast. Host of the popular Fishyaker YouTube channel, Oast travels extensively competing in fishing tournaments and promoting the sport. His angling exploits have been featured in various regional and national publications, videos and television shows. What are Toast’s picks for the top ice fishing spots in Columbia & Montour Counties? #1: Lake Jean, Ricketts Glen State Park – The 245-acre Lake Jean, near Benton in Columbia County, is home to game fish, panfish and trout. With its more than 13,000 acres, Ricketts Glen State Park is one of the most scenic areas in Pennsylvania. #2: Roaring Creek Tract, Weiser State Forest – McWilliams Reservoir, a 338-acre lake located in Columbia County, is one of three reservoirs in the Roaring Creek Tract off of Route 54 outside of Elysburg and Bear Gap. #3: Lake Chillisquaque, Montour Preserve – Lake Chillisquaque, a 165-acre reservoir on the middle branch of Chillisquaque Creek, was built as a backup cooling water supply for the nearby Montour Power Plant. Ice fishing is a popular winter activity at Lake Chillisquaque when the weather allows the safe formation of ice. In fact, most of the largest fish caught from the lake were pulled from below the ice. Learn more on fishing at the Preserve. #4: Briar Creek Lake, Berwick. Located in Columbia County, Briar Creek Lake is a 51-acre impoundment owned by the Commonwealth of Pennsylvania and managed by the Fish and Boat Commission for public fishing and boating. The Commission stocks Briar Creek Lake with trout. It’s designated as “Stocked Trout Waters Open to Year-Round Fishing”. #1: Ice Auger – Manual or powered, gas or electric. #2: Ice Fishing Rod and Reel – Choose a shorter rod for the confines of an ice shelter. #3: Tip-Ups – Cover more water! #4: Ice Fishing Lures – Spoons, jigs, or live bait. #5: Ice Fishing Scoop – Keep your freshly drilled hole clear of slush and keep it from refreezing! Safety is very important when ice fishing. Here are some tips to follow to make sure you stay safe. 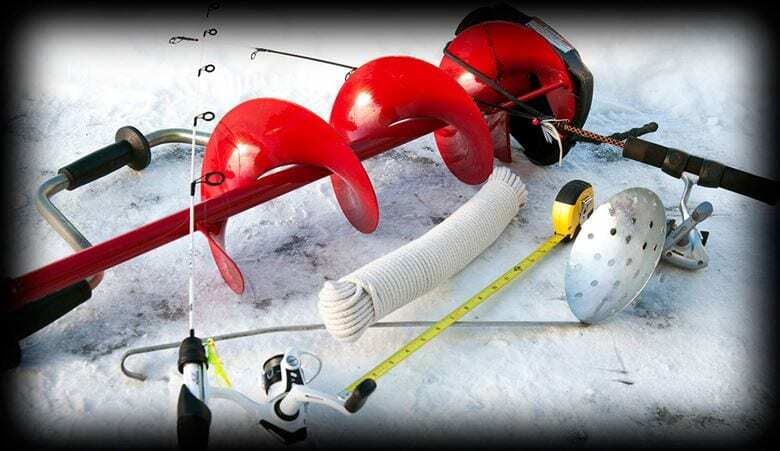 Test ice thickness with an auger. Four inches of solid ice is the minimum recommended thickness for a single person. Seven inches of solid ice is the minimum recommended thickness for a small group. Be aware of changes in ice thickness across a body of water. Perimeter ice is weaker due to shifting, expansion and sunlight reflecting off the bottom. Avoid areas with protruding logs, brush, plants and docks. These structures absorb heat, weakening the surrounding ice. Avoid areas with multiple or intersecting cracks as well as standing water over ice. #1: Bibs, Jackets, and Gloves – Dress for the weather! #2: Ice Cleats – A busted hip lasts longer than your ice fishing outing! #3: Ice Picks – If you fall through the ice, you can pull yourself out. #4: FRIENDS – Fish in a group, to ensure safety in case of injuries, or breaking ice! #1: Ice Shelter – Stay warm and cozy, while on the ice! #2: Sled – It’s way better than carrying gear to your spot! #4: Ice Fishing Seat – Heck, a 5-gallon bucket with a lid works great! #5: Fishfinder – Some think a sonar is cheating, but if you have the tech, use it! Now get out there and catch some fish!